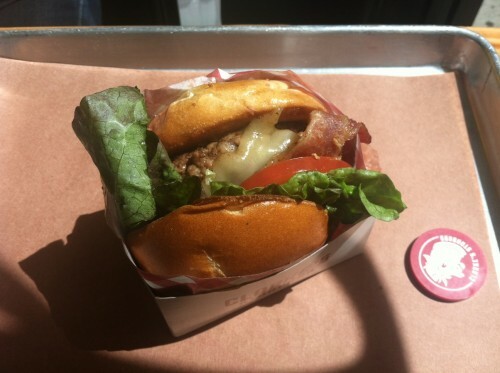 When I saw Blondie’s review a few months ago about Clarke’s Standard, I’d been meaning to check out the burgers for myself to compare how they would stack up against my Shake Shack and Burger Joint leaning preferences. 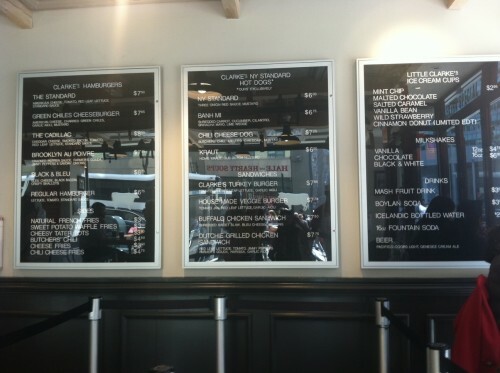 However, as I browsed the menu one thing certainly wasn’t standard: what’s this “Banh Mi Dog” doing on here? Naturally, my game plan for lunch changed. 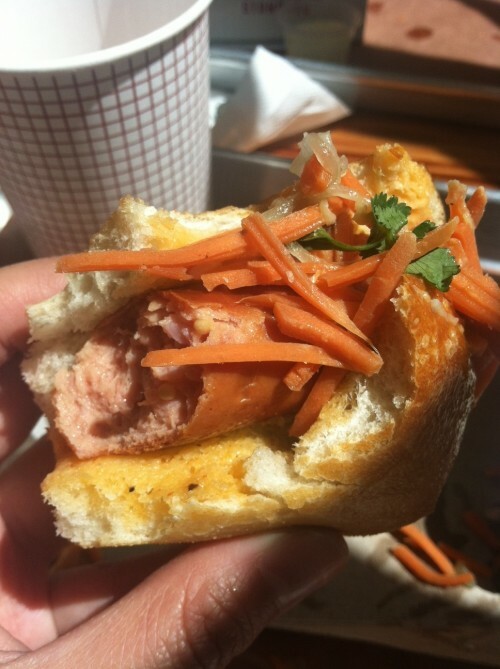 The Banh Mi Dog, priced at $6.75, is the only thing on the entire menu at Clarke’s Standard that is not standard, which was a little suspicious. 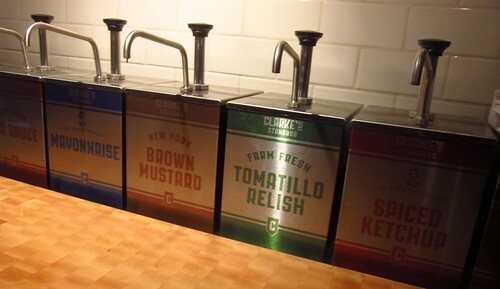 It’s also a little steep for a hot dog, or a Banh Mi, however, Clarke’s prides itself on its “super premium custom blend jumbo hot dogs, ours exclusively” that it seemed worth taking a risk on. The dog itself was surprisingly light to me – it almost tasted like a chicken sausage – but what really stood out about the dog were the toppings included. The fresh pickled carrots and cucumber along with the Sriracha mayo offered a nice combination of vinegar and spiciness, which was pretty refreshing as compared to the normal greasy dog. It’s also topped with cilantro, and you’re given a lime wedge on the side for an extra kick. After one bite, I didn’t even feel the need to hit up the condiment aisle. Clarke’s also differentiates their dog from the others by serving it on a crusted baguette, which I thought was a good choice, as it was robust enough to handle the toppings and sauce, as well as more reminiscent of a Banh Mi. In addition to the Banh Mi Dog, I split an order of sweet potato waffle fries ($3.50) with my friend who ordered the Cadillac ($8.50), pictured below. The sweet potato fries were more on the crispy side, and it almost felt like they had been sitting in the heat lamp tray for a little bit, so next time I’d probably go with the cheesy tater tots that Blondie raved over. 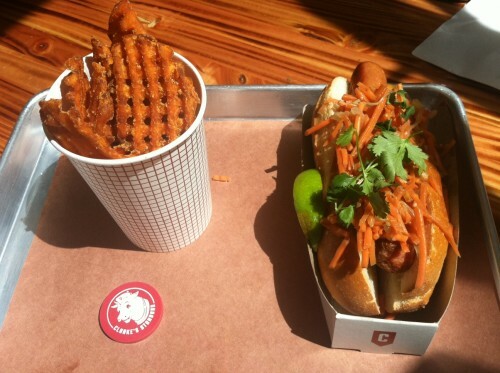 My friend also took a bite of my Banh Mi Dog and thought that it had more flavor compared to her Cadillac burger, which is at its heart, a bacon cheeseburger. Despite our feelings towards the fries and burger, we ended the meal on a high with Little Clarke’s Ice Cream Cups ($2.95 each), which, when I go back to try the burgers, I will definitely be leaving room for. When you initially order your food, you order the ice cream cup and Clarke’s gives you a red token. This allows you to be able to eat your meal carefree and redeem your ice cream cup, still cold, at the end of your meal. Genius. First off, eating the ice cream out of the little tub with a wooden paddle took me straight back to elementary school. It’s just so satisfying to eat ice cream that way. 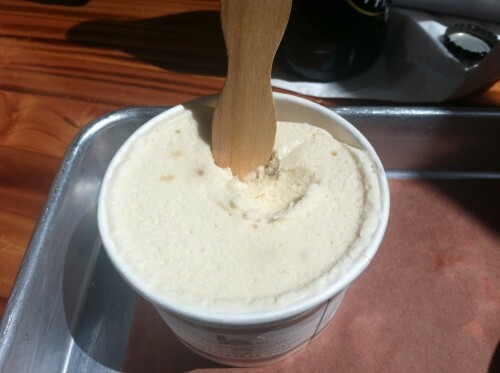 On top of that, I had the salted caramel and was impressed by how much caramel was actually present in my ice cream. 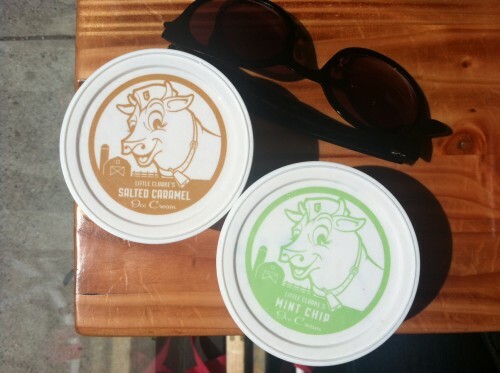 It wasn’t just flavored as salted caramel – there were legitimate chunks of caramel sprinkled throughout. Clarke’s doesn’t skimp on the sweets! All in all, though the meal I had in total was a little over $10, I have to applaud Clarke’s for doing something interesting with the hot dog. Their take on the Banh Mi wouldn’t necessarily quell a hankering for a Banh Mi, but it’s a refreshing change from the usual hot dog. And, if anything, this is going to be one of my go-to ice cream spots this coming summer! Posted by Alexa C. at 11:50 am, April 26th, 2013 under Clarke's Standard. Ah, unfortunately wasn’t able to get pictures against the Metrocard, sorry! The ice cream was a pretty good size amount, though. It was about as wide as a normal sized mug, but maybe half as tall. I almost thought I was going to take some of it to go because I was pretty full after the dog and fries, but couldn’t stop eating it. you know what should be standard? including the location of places you’re reviewing! It doesn’t say anywhere in this review where this place is located. I’ve never heard of it. A little help? not that i disagree, but http://justfuckinggoogleit.com/ might help. 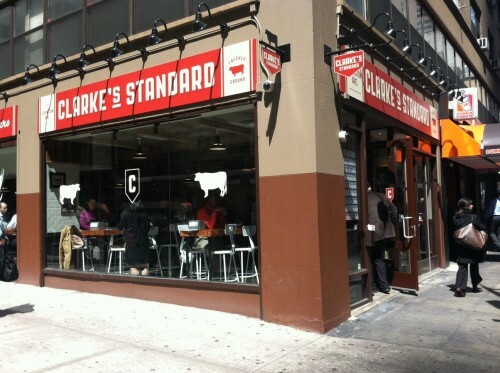 A bit bigger, a bit differenter at Clarke’s Standard. I enjoy both places. Forget about the hot dog. Try the Buffalo Chicken sandwich. It’s better than the burgers.